Electricity is such a necessary part of our everyday living that it’s easy to take for granted. Yet more than 140,000 electrical fires occur and nearly 400 people are electrocuted each year in the United States, according to the U.S. Consumer Product Safety Commission. To avoid electrical shock: Any receptacle in your home that is located within 6 feet or less of any water source must be a GFCI-protected receptacle. A GFCI-protected receptacle will trip off the line at 5 milliamps to protect you from electrical shock. To avoid electrical fire: When you turn in an appliance that trips a circuit breaker in your electrical panel, do not keep resetting the breaker and turning the appliance back on. The circuit breaker trip is telling you that the electrical circuit you plugged into is overloaded and could put you at risk for fire. Call a qualified electrician when: You smell melting or overheated plastic material. This is usually the result of a loose terminal or wire connection on an electrical device such as a receptacle in a wall. If not found and replaced, an electrical fire is extremely likely. Never: Use frayed, severely kinked or smashed insulation jackets on cords of power tools or extension cords (indoor or outdoor). Replace and dispose of the damaged cords. Do not use electrical tape to repair a damaged cord and assume it’s now safe to use. In addition to these tips, it’s important to check your home’s overall electrical wiring. Homes built before 1972 and wired with aluminum are at an increased risk for electrical fires, according to the U.S. Consumer Product Safety Commission. When considering electrical upgrades to your home, new technology such as dimmers, times, remote control or smart panels, and motion sensors, can help to save energy and reduce utility costs, in addition to meeting today’s electrical safety codes. If you are concerned about your home’s electrical wiring, call on a qualified electrician to conduct an inspection. 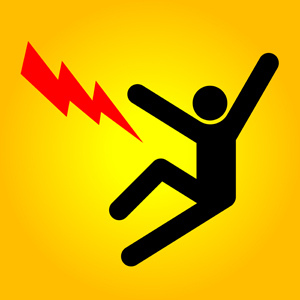 If you’ve been injured from electrical shock or fire, contact our team at Katherman Briggs & Greenberg.